Electronic states within an atom are extraordinarily sensitive to fields and forces surrounding the atoms. For many years resonant light absorption in atomic vapors has been used as the physical basis for optical instruments, including atomic clocks, magnetometers, and inertial navigation devices. 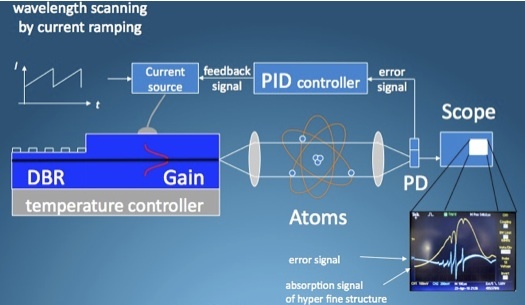 Recent advances in understand the underlying atomic physics have led to a variety of advanced concepts for instrumentation. Critical to execution in all of these concepts is a narrow linewidth precision laser that can be resonantly tuned and locked to the transition. Rapidly accelerating progress in instrumentation is placing extraordinary emphasis on lasers that exhibit low noise, high output power, and stable operation for periods of years. As a result of extensive development over the last several years, Photodigm is now introducing its Perma-Loc series of semiconductor lasers, a laser designed to maintain lock to the transition for its entire lifetime. We take advantage of the fact that DBR laser current tuning is deterministic, whereas DFB laser current tuning is subject to random, fatal mode hops. Photodigm engineer observes the faint deep red glow of rubidium vapor, fluorescing at the D1 transition (795 nm), when excited by a Photodigm laser tuned to the D2 transition at 780.24 nm. 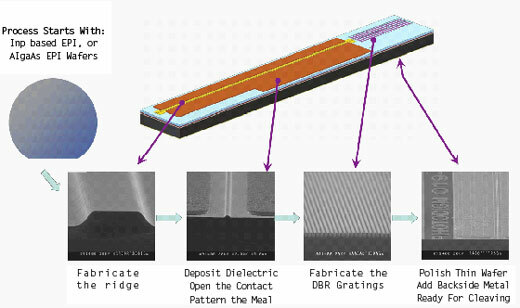 The Photodigm family of high-power, edge-emitting Distributed Bragg Reflector (DBR) lasers is based on Photodigm’s proprietary DBR architecture. The graphic below shows the key elements in the unique design of the Photodigm laser. Laser light is generated as electrons are pumped across the p-n junction in the active ridge region. This narrow volume establishes the single spatial mode characteristic. The DBR gratings are designed and fabricated to form a narrow band pass reflector outside the active region, in a passive area. The DBR reflectivity is designed select a single longitudinal mode. Diffraction limited, single frequency laser light is emitted from the front facet. The front facet is coated with a proprietary facet passivation that protects the surface from oxidation. The graphic shows the unique design of the Photodigm DBR laser. Single growth epi, combined with precision fabrication of ridges and passive gratings results in unmatched power, reliability, and stability for applications requiring a high power, single longitudinal and spatial mode source. Deterministic and invariant wavelength tuning. 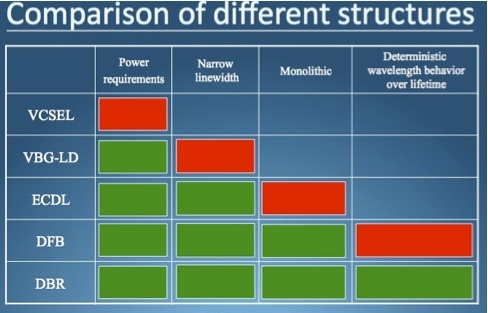 As can be seen in the chart, VCSELs do not deliver high power, VBGs cannot deliver the narrow linewidth, ECDLs are complex hybrids and are delicate, and DFBs do not produce a deterministic wavelength curve over life. Only the DBR meets all the requirements for atom optics. The chart on the below shows the principle of current-locking a laser to a transition. The laser is temperature tuned to the transition, where the light is resonantly absorbed. 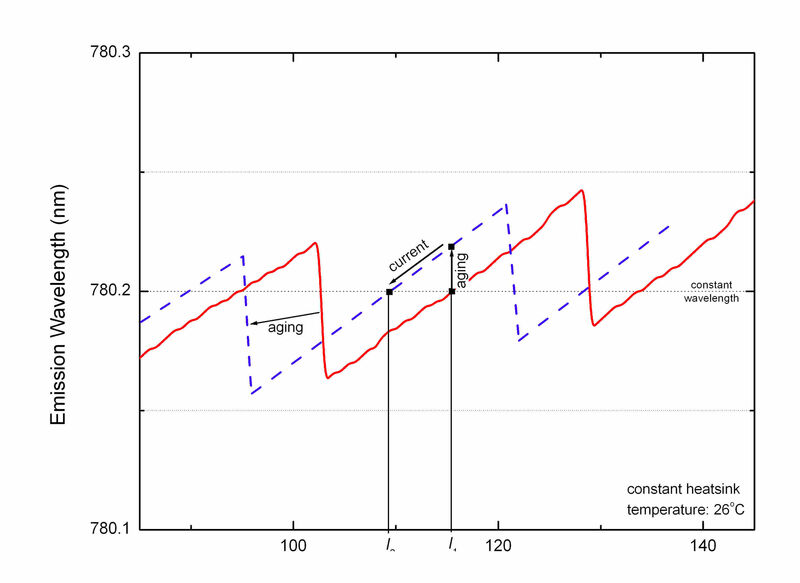 DBR current tuning is used to achieve the final adjustment. A small signal modulation is superimposed on the drive current, and a PID controller captures the error signal to maintain lock. Mission critical frequency standards require that the laser maintain lock over years. A single wavelength discontinuity event could cause mission failure. Aging of the laser is a normal phenomenon, and is associated with loss of optical efficiency resulting in a drop in optical power, Popt at constant total power, Ptot. The dissipated power increases over life, ∆ Pdiss = Ptot– ∆Popt, resulting in a rise in the junction temperature, Tj. The lasing wavelength is a sensitive function of Tj, increasing as Tj increases. In a constant Ptot mode, the lasing wavelength will increase over time. In order to maintain lock as the laser ages, the PID controller shown in the chart above will lower Ptot to maintain a constant wavelength. Characteristically DBR lasers exhibit wavelength discontinuities over a current sweep. To understand how wavelength-locked DBR will remain deterministically locked over lifetime, we must consider the mechanism for wavelength shift due to aging. As shown on the charts below, the laser light is generated in the active region, at a wavelength determined by the gain curve of the epi. Multiple cavity modes may exist within this gain curve, depending on the effective length of the laser cavity. The passive DBR is a narrow bandwidth reflector that selects a specific cavity mode nearest to its peak DBR reflectivity, shown in red on the charts below. Without a lock, aging will cause the lasing mode to red-shift, and eventually a mode hop will occur to keep the lasing mode at peak reflectivity. 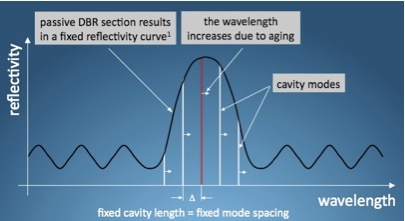 Because the DBR is passive, it does not age during the life of the laser, and the DBR reflectivity curve does not change. However, if the laser is locked to a transition, an error signal will counteract the red-shift. The current will be lowered just enough to keep the laser on lock, and the laser will never jump to another mode. A DBR laser exhibits totally deterministic wavelength tuning with injection current. As shown at below, the free spectral range is determined by the cavity modes, whose spacing is not affected by aging of the gain medium. By current-locking the laser to a spectroscopic transition, the lasing mode maintains a fixed position relative to adjacent cavity modes, suppressing any mode discontinuities. The result is that the laser is permanently locked over the entire lifetime. Aging of the laser results in a drop in optical efficiency. Furthermore the feedback signal required to keep the wavelength constant further decreases the output power. The end of life is defined as the time to observe a specified drop in output power. Alternatively, if the application requires that the power be held constant over life, the temperature can be lowered. The temperature-induced blue shift can counteract the aging-induced red shift while maintaining contstant power. 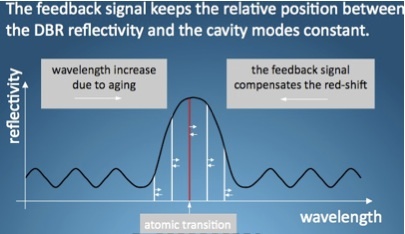 Because of the deterministic behavior of the wavelength over time, aging occurs gracefully and predictably. By operating the laser conservatively, multi-year mission critical lifetimes are possible using Photodigm Perma-Loc lasers.